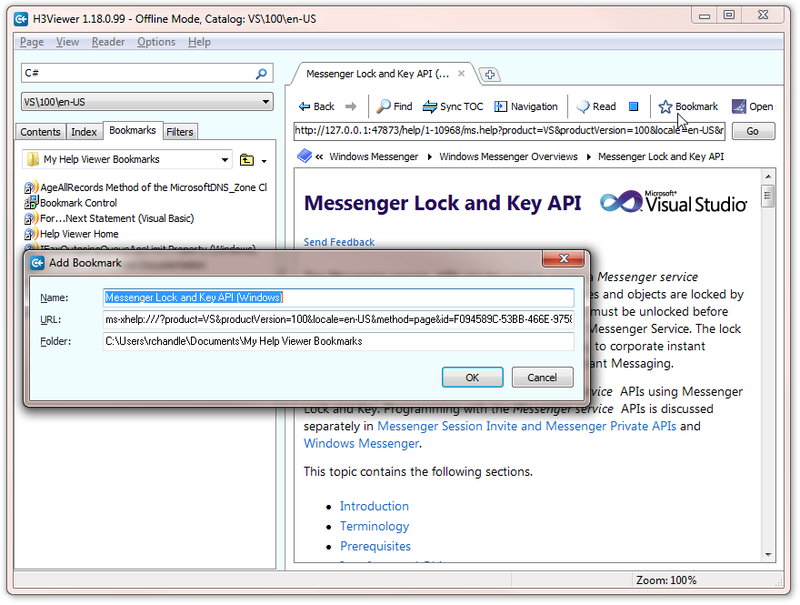 Replacement offline help viewer for VS 2010. 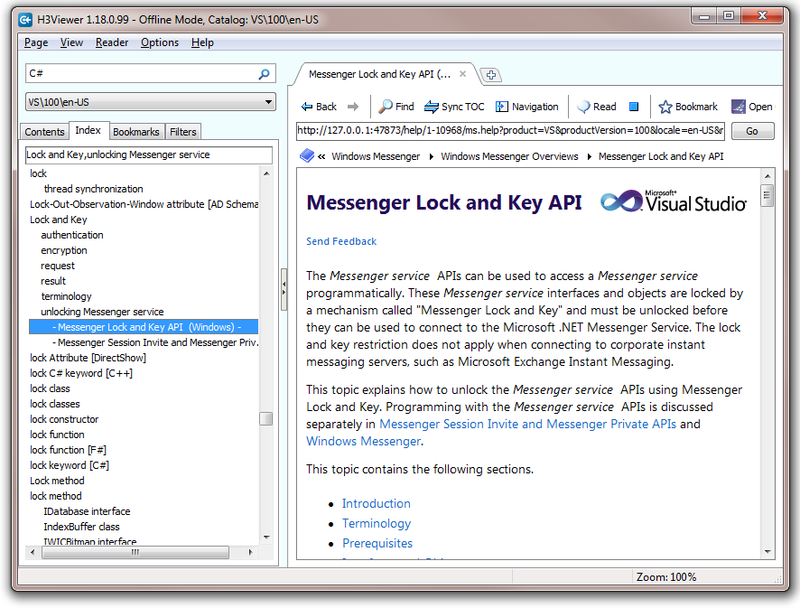 Similar to the old VS 2008 DExplore. 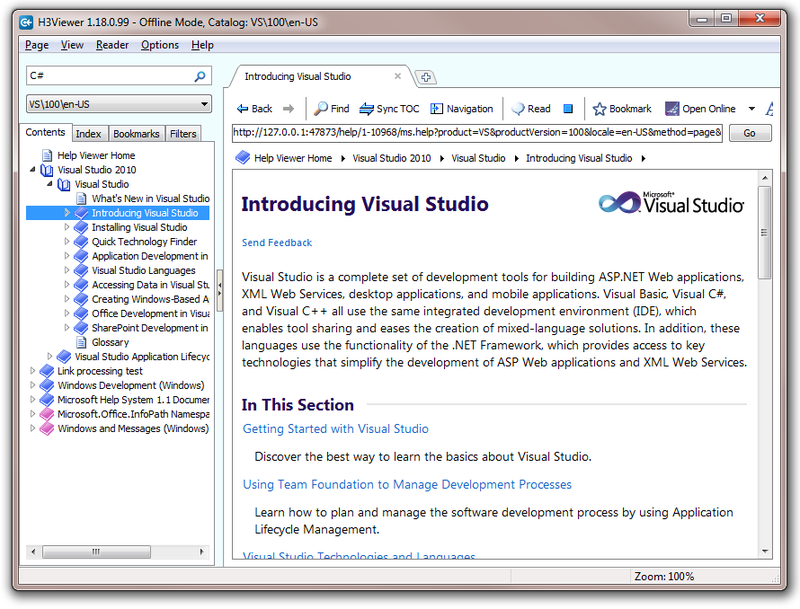 Replace the VS 2010 help viewer or run stand-alone. The viewer is free for personal use. Contact us if you need to distribute it. Similar experience to VS 2005\2008 DExplore. Full TOC with TOC Sync. Full Index. Modes: Load full Index; Load partial list (fast load). 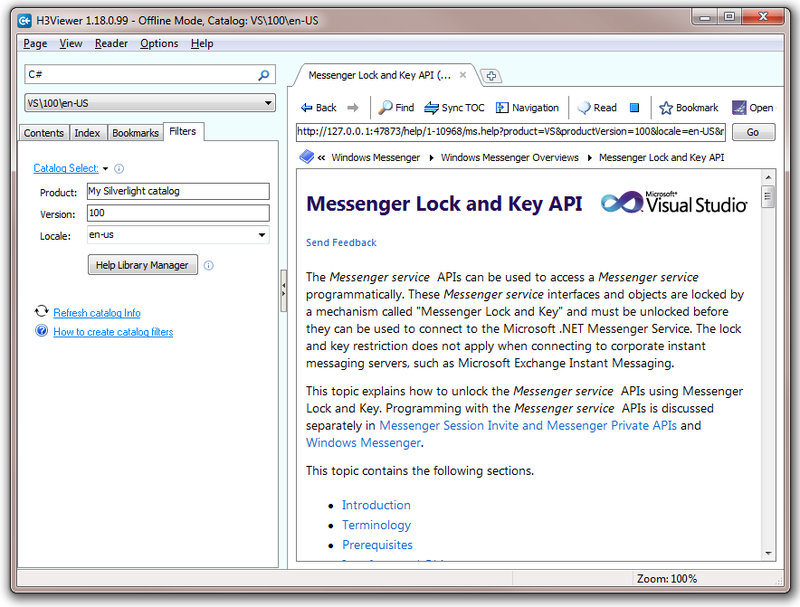 Set default viewer for VS 2010. Option: Open F1 help in a new page tab. 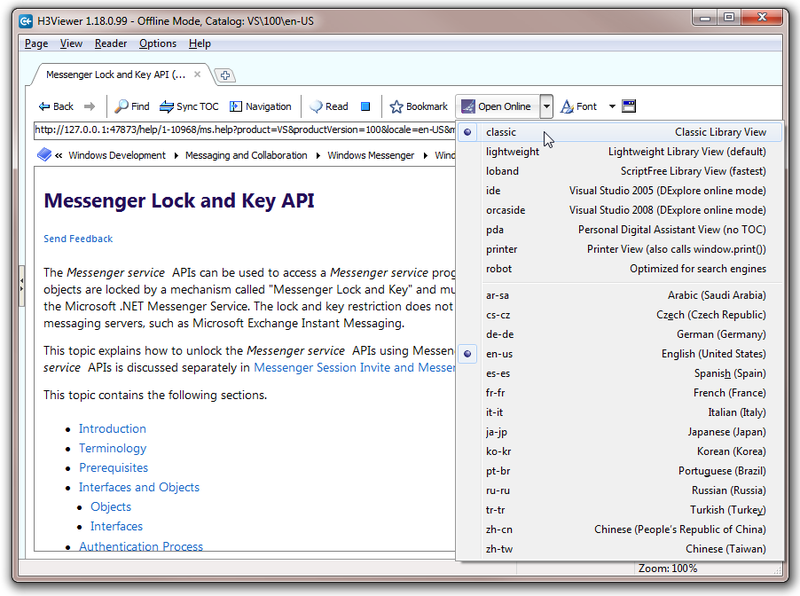 View different MSDN language catalogs. UI Translations available (see below). Direct link to equivalent MSDN online page. Open current page in selected browser. Uses catalogs to filter content. Now translated into 14 languages + English. Don't see your language? Help us translate. It's easy. If you find pages are not showing style correctly and some links are not working then it probably means you have the Help Viewer power toy Beta installed. Uninstall this and it will immediately return to normal. Also remember to stop the Agent tray application. Freezes -- We think we have fixed the random application freezes in build 1.1.0.62. If you still experience hangs please let us know. Full TOC same as DExplore in VS 2002\2003\2005\2008. The TOC is built as you expand nodes. Notice the pink folders? These are orphan help branch not attached to the main VS 2010 TOC. Use TOC Sync command to add orphans if found. Inline Index disambiguator. 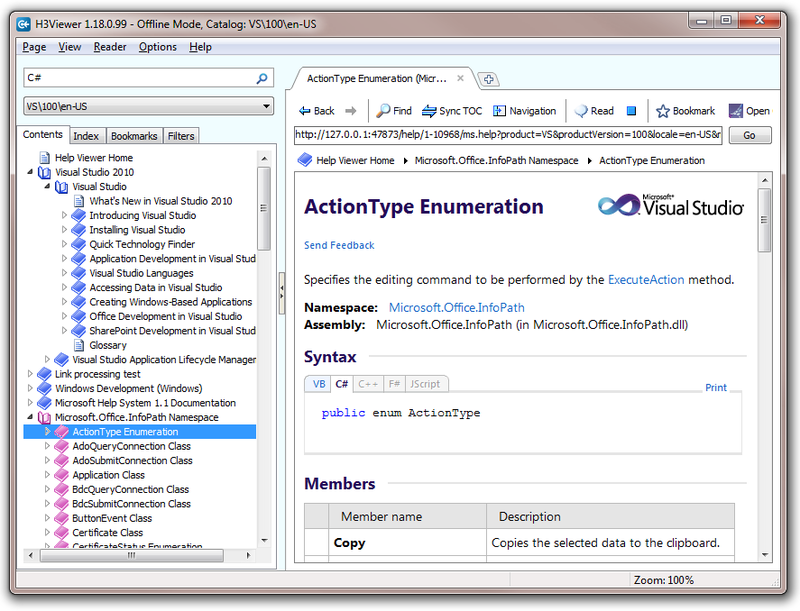 Load full Index (VS 2008 style) or partial load as you type (see Index right-click menu). Full bookmark support for Help Viewer URLs. A filter page allows you to edit catalogs (add\remove content). You can then use catalogs like filters. View the equivalent online content in whatever language and format you want. Here we've downloaded Russian help (vs\100\ru) using VSHelpDownloader. 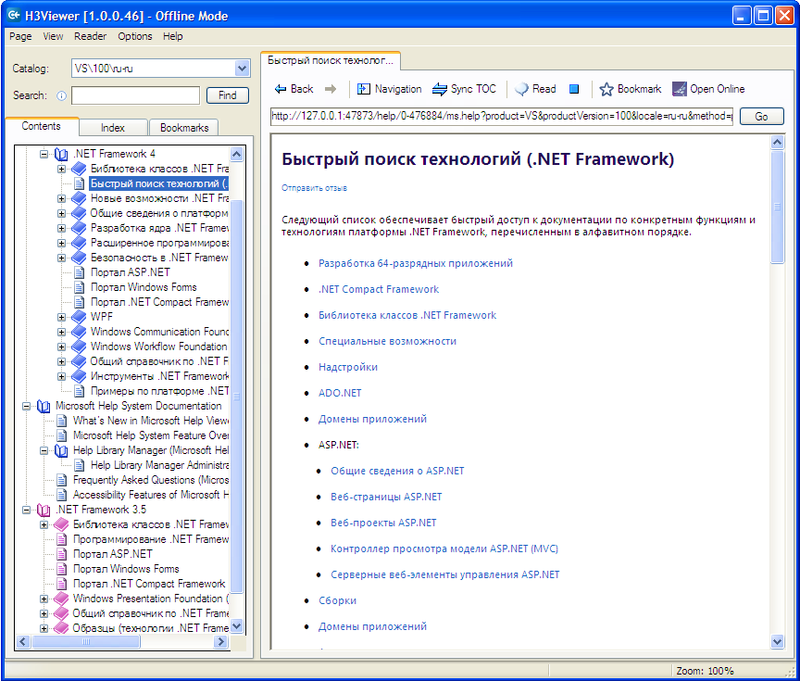 Press F1 in VS 2010 to display the topic in whatever language is loaded.